My favorite piece of technology in my house is my Amazon Echo. It offers me so many great features with quick voice activated access to the time, music, weather, the news, traffic, local stores, and much more. It even pairs with other devices to turn on my lights, adjust the thermostat, put shopping items on my iPhone and more. When I explored this device, I purchased a second Echo for my office, at Learning to Learn, when I realized all the great ways that it could benefit my students! The Amazon Echo is a wireless speaker and voice command device from Amazon. It is a 9.25 inch tall, cylindrical black microphone/speaker that allows voice commands. It responds to the name "Alexa," but this can be changed to "Echo" or "Amazon." There are a number of things you will need for the Echo to work. You will need an Amazon Prime account. You will want to pair the Echo to a Smartphone. You will need to have a wireless system in your home. What are the Many Benefits of the Amazon Echo for Students? 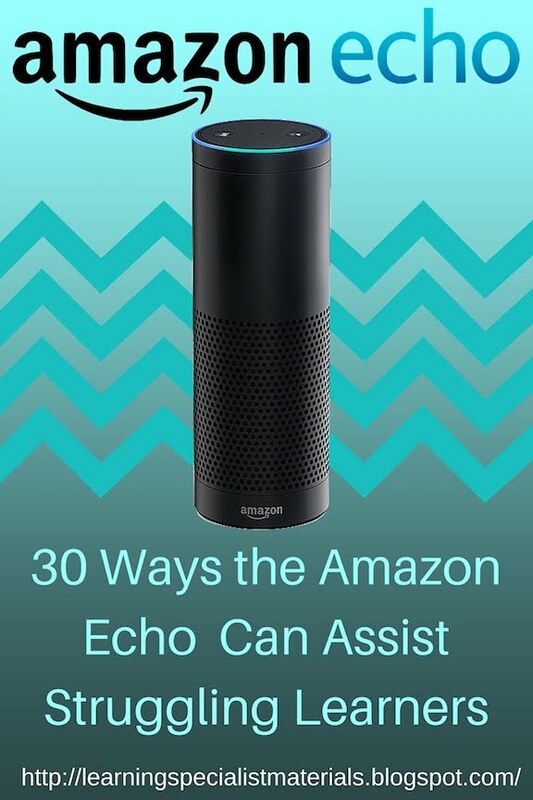 The Amazon Echo offers a number of built-in commands as well as "skills" that can be enabled on your smartphone. Ask for a definition by asking, "Alexa, what's the definition of benevolent." Ask for the answer to simple numerical math problems. "Alexa, what is 346 times 98?" Add tasks to a to-do list. "Alexa, put math worksheet on my to-do list." Inquire about traffic information from home to school. "Alexa, what's the traffic?" Set timers for study time and breaks. "Alexa, set the timer for 10 minutes." Set a bedtime timer. "Alexa, set an alarm for 8:30." Ask for information from Wikipedia. "Alexa, Wikipedia global warming." Play music by artists, albums and genre. This can be helpful for some students that like to use music to block out unexpected noise. "Alexa, play Mozart." Listen to your Audible account or Kindle books. "Alexa, read The Great Gatsby." Set an alarm to wake up in the morning. "Alexa, set an alarm for 6:45 in the morning. Listen to Alexa read events on your Google calendar. "Alexa, what is on my Google Calendar?" Play white noise such as ocean waves from prime music. "Alexa, play ocean waves from Prime Music." Ask Alexa all kinds of questions about people places and things. "Alexa, how tall is the Empire State Building?" Ask for the spelling of a word. "Alexa, how do you spell, upholstery?" Discover the time in any part of the world. "Alexa, what time is it in London, England?" Ask for the temperature. "Alexa, what is the temperature?" Translate phrases from one language to another by enabling Translator. "Alexa, ask translator to say, 'I love blueberries.' in Spanish." Expand vocabulary by enabling Daily Word. "Alexa, open daily word." Test your presidential trivia knowledge by enabling Presidential Trivia. "Alexa, open presidential trivia." Find rhyming words by enabling Rhyme Zone. "Alexa, ask Rhyme Zone what rhymes with cap?" Find a synonym for a word. "Alexa, ask Rhyme Zone for a synonym for great." Use a stopwatch to help students stay on task by stating, "Alexa, open stopwatch." Practice times tables by enabling Let's Multiply and asking, "Alexa, open Let's Multiply. Take a one-minute mindful meditation by asking, "Alexia ask Mindfulness for a minute meditation. Play simple math games by enabling 123 Math. "Alexa, open one, two, three." Play a metronome beat to help some kids work at a steady pace by enabling Acoustic Metronome. "Alexa, open metronome." Practice state capitals by enabling Capital Quiz. Alexa, tell Capital Quiz to start practicing." Discover measurement conversions. "Alexia, how many tablespoons in a cup?" Learn statistics and dates of historical events. "What is the population of the world? Plays Simon Says and the Echo will repeat what you say. "Alexa, Simon Says - Peter Piper picked a peck of pickled peppers." This can be a great tool for students that need to practice their expressive language skills and need to better enunciate and pronounce their words. Almost every week the Amazon Echo sends me emails about new tasks and features! What will they think of next? The Amazon Echo sells on Amazon for $179.99.